LAPWAI, Idaho - There aren't many trees growing in the dried-up soil and rocks on either side of this half-mile stretch of Lapwai Creek. But a high school biology class and a tree-planting crew took steps recently to bring lush greens and shade back to this area in an effort to increase salmon habitat. Lapwai High School sophomore Josiah Hillman was one of about 40 students who turned out to take part in the project being completed by the fisheries watershed division of the Nez Perce Tribe. "We're trying to make the creek cooler for the fish to live in it," said Hillman, one of several students placing biodegradable weed control mats over the freshly planted trees. The tribe, with the help of the Bonneville Power Administration and the fisheries division of the National Oceanic and Atmospheric Administration, is currently planting about 8,000 trees and shrubs to help restore the riparian forest that has eroded over the years. There aren't many fish traveling through now, but students and biologists said the planting will eventually provide shade and cool water for the salmon. The rocky ground prevented students from planting the trees with shovels, and required the use of a specially mounted excavator to plant the trees and shrubs in the ground. 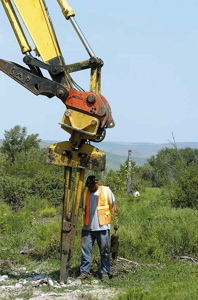 Kent Werlin, the tribe's project area manager for the restoration project, said a special piece of machinery, called an expandable stinger, can place the trees deep into the hard ground, where a shovel could never make it through. An irrigation system will soon be set up along the project's boundaries to help saturate the new trees, Werlin said. The goal of the project is to eventually provide a root system and shade for fish habitat. Werlin said the trees will hopefully provide a source for wood debris and other pieces of fish habitat. "It will also develop large root systems which will prevent streams from eroding," Werlin added. The planting is the final stage of the three-year project, which is being completed with about $165,000 in grant money from NOAA Fisheries' Restoration Center and the BPA. Representatives of the project came out to witness the planting. The restoration was initially proposed by Emmit Taylor Jr., a Nez Perce tribal member who grew up near Lapwai Creek and now works as deputy director for the watershed division of the tribe's fisheries department. Taylor heard stories growing up about the abundant fish runs on the creek, and said he wanted to see this section restored like other sections of the creek where vegetation is more prosperous. "If we can get the survival rate we hope, you won't notice this place in 10 years," he said. Helping place the weed control mats, Lapwai junior Natasha Weaskus said these plantings will eventually help fish come through this creek bed. "I like doing stuff like this," Weaskus said. "It helps with the fish and brings the fish population back." Jennifer Boie said the black mat will help keep the weeds away from the freshly planted trees, and itself will biodegrade over time. Boie is a habitat biologist with the tribe's fisheries watershed program, and has been coordinating the program with students in the classroom. Some of the students in Paul Smith's biology class have been visiting and witnessing the changes of the restoration project over the last three years. Smith said his class has come to witness weed control methods and water tests at this and other sites throughout the Lapwai Creek Watershed in previous years. This project underwent three years of weed control, including the use of grazing goats, before the planting got under way. "In the summertime around here, this water gets [to be] 100 degrees and it gets way too hot for the fish," Smith said, noting these trees will eventually provide some needed shade. But Boie said the students who have come to the watershed the last three years may already notice some differences. "They've seen a progression, especially on trees," Boie said. "From talking with the students, I'm getting the feeling that they are beginning to realize they can make a difference."